Well, there’s no getting away from it – Halloween does have a bit of a focus on death. Hallowe’en (All Hallows’ eve) comes from the evening before All Saints Day – a Christian festival on November 1st. It remembers the saints who are sleeping and waiting to rise with Christ. Saints often suffered for their faith, many losing their lives in martyrdom and so a macabre connection with death developed during the time of the Black Death. 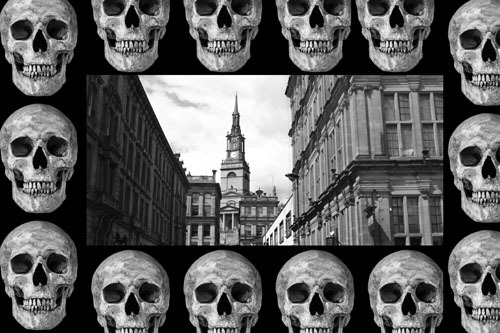 So, with this in mind, lets look at some depictions of death in Newcastle and what happened after death! The best place to start is with Bishop Walcher (the Bishop of Durham) who was cut to pieces outside the church of St. Mary in Gateshead in 1080 while much of his entourage burnt inside the building behind him. 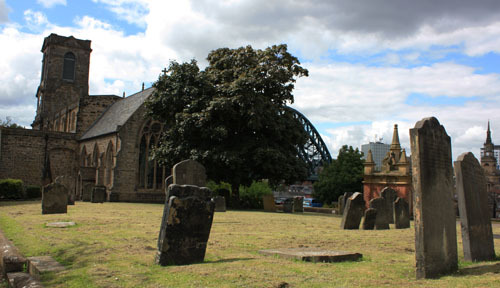 As it highlighted the need to defend the area with the building of a castle, this was the start of Newcastle’s story and in some ways, was just the very first gory story connected with the city. A couple of centuries later, during the Scottish wars the Scots warlord William Wallace – heroically depicted by Mel Gibson in Braveheart – came south to attack the English and met with a brutal end. Though betrayed as a Scottish hero he had been pillaging against the Scots the year before he started his major attacks on England! Interestingly Wallace may have been of Norman decent because Wallace is a corruption of the word ‘foreigner’ and perhaps less ‘Scottish’ than people think. When Wallace came down to Newcastle, the town and castle had prepared in advance and he looked upon the defences and realised he would lose far too many men and resources attacking such a well-defended town. He gave up and went to Corbridge instead, sacked it and crossed south towards County Durham and Yorkshire. Wallace made a great deal of mischief further south before he was captured and taken to London where he was hung, drawn and quartered. This medieval punishment involved the individual being hung to near death and then their limbs were dislocated by pulling. It was then that disembowelling took place while the victim was kept alive and finally they were beheaded and cut into quarters. The film Braveheart missed most of this. It was a death for traitors of the worst sort and Wallace’s body parts were sent off to the various parts of the county. His head was ‘affixed upon London Bridge’ while his body was divided amongst Berwick, Stirling, Perth and Newcastle, which received his right arm. It was meant to cause ‘fear and chastisement of all going past and looking upon these things’ as a report on his execution stated. Imagine walking across the swing bridge and looking up to see a rotting arm hanging there. Alongside this, some of the accounts say Newcastle received parts of his ‘organs’ – read this as you will. It would not be the last time Newcastle was graced with body parts. Northumberland is a great distance from London and the Lords and landed peoples have at times been a law unto themselves. One noted family were the Lisles who lived at Felton in Northumberland. The Lisles were infamous for having a bad relationship with the Church, having on several occasions physical altercations with the local priors. In 1526 it came to a boil: William Lisle and Humprhey Lisle came into confrontation with the Prior of Brinkburn and vicar of Felton because they were occupying fields that belonged to the church and had started to harvest the grain for themselves. When the Prior challenged the Lisles for their behaviour and asked them to leave, Humphrey killed him with a sword. This resulted in William Lisle, John Ogle, William Schafthowe and Thomas Fenwick being taken to Newcastle to be hung, drawn and quartered for treason against the King. 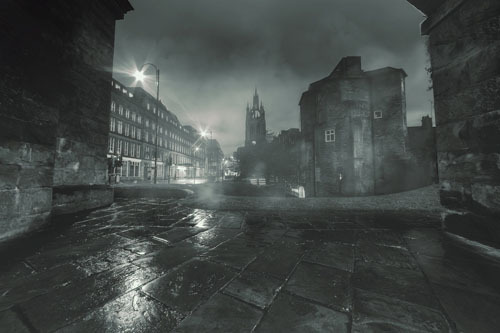 Their body parts were then hung from Newcastle castle and around various parts of the town. It was because of this heritage, that the Wylam Brewery launched a beer in 2015 at Newcastle castle called ‘Hung, Drawn and Quartered’ to commemorate this particularly grim event. From the accounts of the time, though, outside of their family no one particularly missed the executed men as they were reivers and attacked people on both sides of the borders to supplement their incomes. 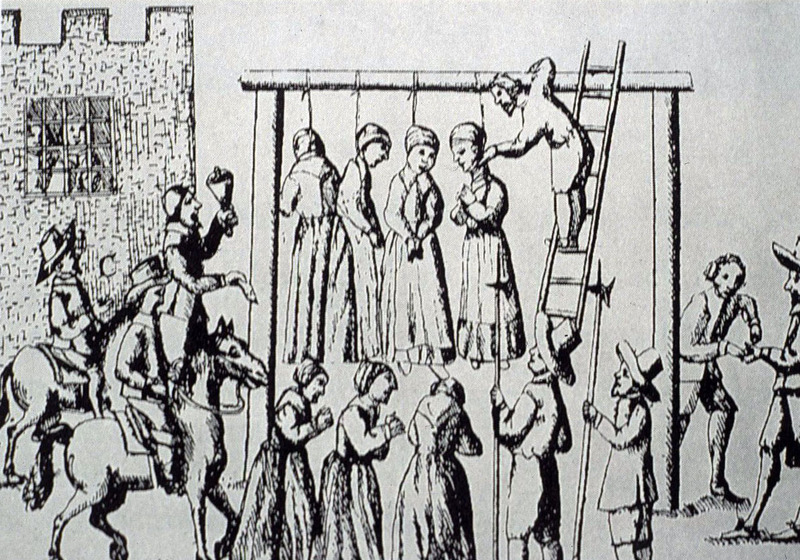 When it comes to Man’s inhumanity to Man, one of the great examples I personally think about are the witch trials in England after the English Civil War. This period is famous for being one of great upheaval. Friends and families were often split in two as they supported the Royalist and Parliamentarian factions. As in all wars, the loss of life affected people’s lives and the economy. Disease was spread by armies and disposed peoples. All in all, people were looking for someone to blame. Witches were a perfect target. During the middle ages – contrary to modern belief – magic was not believed to be an actual force. Monks, priests and the authorities pointed out the sovereignty of God and ridiculed the idea of magic – much like modern scientists. 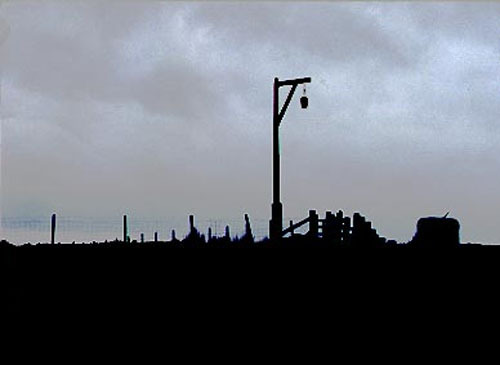 Most ‘witch trials’ were conducted by secular courts. During times of fear such as the civil war this increased dramatically. I imagine the crowd being left with a sense of security and peace after this horrific occurrence. These ‘witches’ who had plagued them with disunity, disease and being servants of the devil were now dead. Their bodies were dumped into a mass grave in St. Andrews Churchyard at Gallowgate, without ceremony. The Scots witch hunter, Cuthbert Nicholson, who had been paid 20 shillings per witch had been using a retractable needle with a long handle so it appeared that the accused did not bleed – a sign they were in league with the devil. He was eventually caught and confessed to the false execution of 220 women throughout the entire North. He was executed by hanging just as his victims had been. In the Victorian period, the care for the human body after death had still not improved. With the expansion of the British Empire and the interest in the classics there was a fascination about Egyptology. Mummies would be bought on mass and delivered to locations to be unwrapped in front of audiences. The Mummy Irtyru who can be seen in the Great North Museum (then the Hancock Museum) was brought to Newcastle to be unwrapped. She was unwrapped in two hours. With 22.5kg of bandages on her body this shows that they were rushing! Her organs which were kept in Coptic jars were rushed to the Royal Victoria infirmary only to be ‘lost’ – one theory is that they ended up in a private collection. When Irtyru was unwrapped, they wished for an easy way to display her and she was stapled to the back board of her sarcophagus and a hook was screwed into her skull. The final insult to her remains was that when they used varnish to seal her body against decay they trapped carpet beetles in her body. Today Newcastle does not display the body parts of traitors or criminals (no matter how much fans of Newcastle United would likely enjoy this idea) around our city, nor do we have kangaroo courts where the prosecution is paid per person they get convicted. This having been said, let us not look at the past and brand it as barbaric. Each of the events listed here happened within the context of their day and age – what will our descendants write of us in future Halloweens to prove our darker nature and consider the darker stories of our day and age? To discover more why not join Iles Tours on our Gory Tour of the city? If you would like to learn more tales about Newcastle I recommend The Little Book of Newcastle by John Sadler and Rosie Serdiville.